We offer quality repair and competitive prices for all of your exhaust system and muffler repair needs. Make sure to stop by our 811A West Higgins Road location for an inspection, as a damaged exhaust can hurt both your car and the environment. 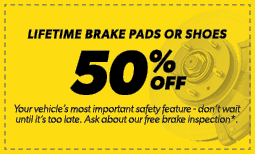 When you need brake repair, brake pad replacement, or even a total brake job, our local Schaumburg, IL Meineke is there to help you with everything you need to drive (and stop) safely. The time that it took for my vehicle to be service was very exceptional. In addition, the technician and manager pointed out couple of serious matters that needs serious attention and was very grateful for pointing that out to me. did excellent work on my Honda. Jes, did a wonderful job on checking my cars' other functions. added air to the tires and checked over everything. Tariq is very knowledgeable and thorough.